The Fremantle WINTERWORLD skating festival opened yesterday to the delight of young and old. The ice rink has been made all weather proof with a roof over it, because last year there was a lot of rain which discouraged people from skating. The big blue slide is always a big attraction and so are the mulled wine and roasted chestnuts. There are a lot of food stalls, from Indian to pizza, so head out to the Fremantle Esplanade for some hours of real winter fun. WINTERWORLD is open every day till mid July. This long bubble tube at the Fremantle Winter Festival at the Esplanade is very popular with children who run and roll around inside it. It looks like a whole lot of fun, so can we have a senior night in them as well? Only kidding! If you haven’t been there, go and check it out. There is ice skating and a huge slide, toboggan, food and drinks and even hot chestnuts and ‘real’ snow. The Fremantle Winter Festival is very popular, especially on a gorgeous sunny Sunday like today, but I am wondering how the small food stall operators will go over the length of the event. While the eastern state ice rink owners receive substantial financial considerations from the City of Fremantle the local food stalls have to pay $ 7,000.00 plus GST to be part of the event. Compare that to the Mandurah Crab Festival that attracts 130,000 visitors in two days and the 3×3 metre food stalls there only cost $ 2,000.00. One wonders who sets the prices for the food stall rent at the Winter Festival. Is it the organisers, BID or City? The ice rink charges are $ 28.00 per adult, $ 19.00 for kids aged 5-15 and kids under 5 just $ 11.00. The huge slide and toboggan ice slide are additional costs, so it is not a cheap family event and lasts less than an hour. A mate of mine returned the hot wine advertised as mulled wine on Friday evening at the bar because it was just hot wine without cloves, cinnamon, etc. but still cost $ 10.00. After heavy early morning rain the sun returned to Freo paradise mid morning to the delight of all the people ice skating at the Winter Festival at the Esplanade. It’s not always easy to stay on your feet but that makes for a funny photo now and then. I am really looking forward to the Fremantle WINTER FESTIVAL as it is always a lot of fun. It is not only in a different location, in the car park south of the Esplanade, but it also looks more cosy with large marquees around it and the National Hotel bar even has an upstairs area to watch people ice skating from. 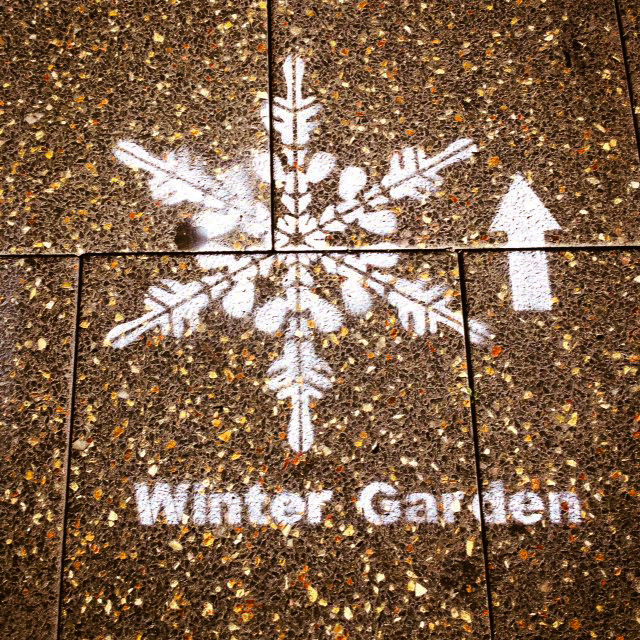 Stencils are being painted all over the CBD so people can easily find the ice rink. It opens on Friday! 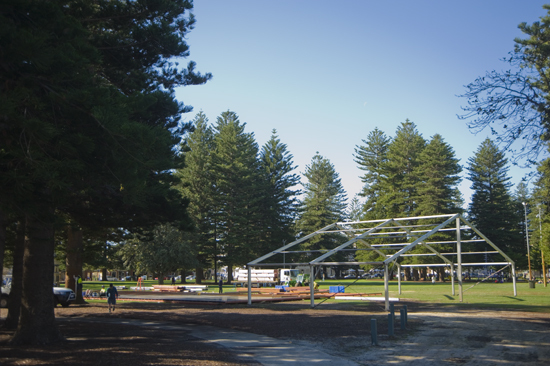 The construction of the ice rink for the Fremantle Winter Festival is on the way at the Italian Club car park just south of the Esplanade Youth Plaza. It will start late next week. There will be food stalls and a bar that serves mulled wine and hopefully hot chocolate for the kids as well. It is a much better location that will not face the same huge rain puddle problems and damage to the Esplanade, as happened last year. If you don’t feel like falling on your bum, it’s great to watch as well and a really nice atmosphere, so bring family and friends and tell everyone! A few photos of the Fremantle WINTER FESTIVAL on the Esplanade. Why not visit this weekend. It’s a lot of fun! FREO WINTER FESTIVAL IS OPEN! The Fremantle WINTER FESTIVAL started today on the Esplanade and will run till July 26. The little kids were the first on the icerink this morning and even got a tiny bit of snow. The large slide will be put up overnight. There will be all kind of entertainment in the teepee and other areas of the festival, there is a bar and several foodstalls that sell bratwurst and sauerkraut, paella, italian food, pastries, churro and burgers, so there is plenty to do and see. Workers have started to set up the ice rink for the Fremantle Winter Festival that will open tomorrow week on July 1 at the Esplanade. There will be a big slide and artificial snow as well as a Winter Garden with events every evening from story telling to a philosophy circle, foodie and dressing up nights, etc. all around nice cosy fires. So it is time to sharpen and oil your skates, get the thermal underwear out and join the Freo community for yet another great event. I feel like mulled wine right now! Yum!! !